The owner likes wines – hence the name of this ship – and there is a large wine collection aboard…. 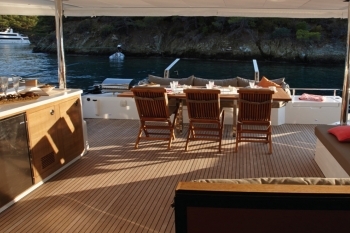 The teak cockpit has a beautifully set dining table, plus bar and large L-shaped lounge, hard top, weather curtains, and stairs to the fly bridge with custom bimini. It opens to a spacious deck saloon through glass doors where there is gray wool upholstery on the L-shaped settee around a coffee table, comfortable for guests. The stainless steel galley is opposite. 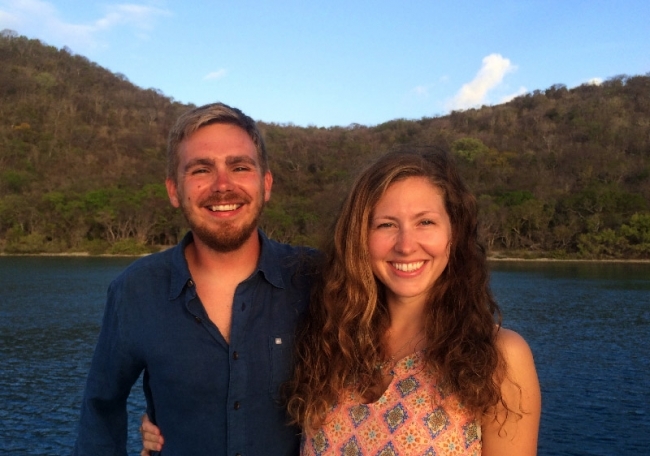 Americans Brian and Ava have been in the Virgin Islands for five years, running two popular charter yachts before joining Port to Vino in 2016…. They love visiting Long Bay on Virgin Gorda and Lee Bay on Great Camino and Saba Rock, where there are giant starfishes…. 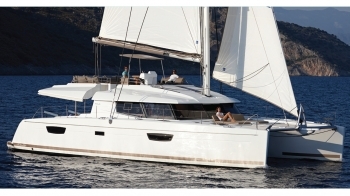 They strive to find places in the BVI where there are no mooring balls and no construction of houses on the hillsides. They ask guests where they would like to go and then offer their own ideas. 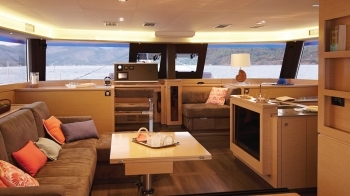 The yacht has USB outlets in every cabin; there is a TV in saloon to steam movies. 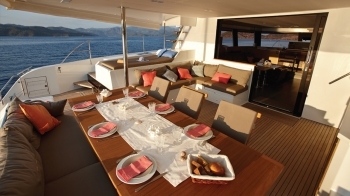 There are speakers all over the yacht that connect to blue tooth phone and iPad; guests can select whatever music they want or connect their own devices…. Ava was throwing a Woodstock party for brokers and enjoys arranging parties for Pirate night, Christmas night, New Year’s Eve night, hippie night, psychadelic night, and she celebrates guests’ birthdays and anniversaries too.